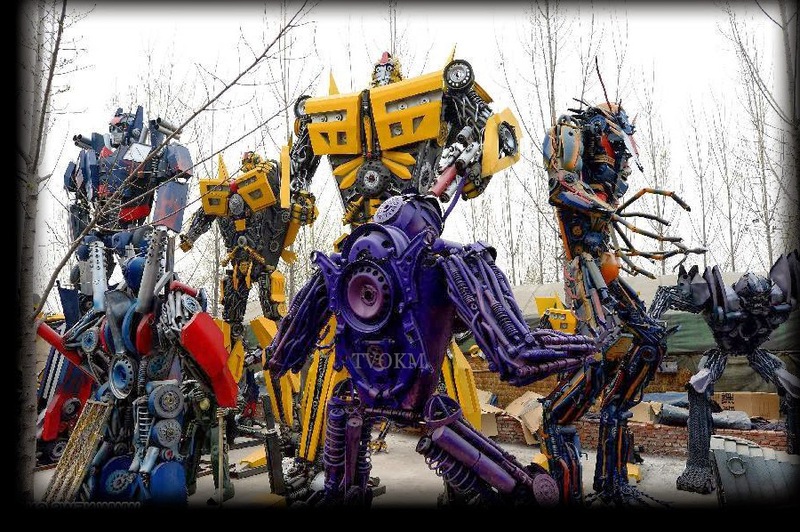 Workers in a used metal removal factory in China have produced about 40 replica robots that resembles the characters from the famous movie, Transformers. Interestingly, they consist of mostly farmers and only took four months to create a replicas of Transformers robot and successfully attracts the attention of the public. Starting with only one robot, the positive reaction of visitors to who visit the place where the used metal was removed and was located on the top of a hill in the city of Jinan, Shandong province near the East China makes the workers produce more robots. According to one of the part-time workers, Li Hung, 21, he wanted to create something that can grab people's attention by using metal from used cars and motorcycles. He thought if people can see amazing things made ​​from secondhand goods, they can indirectly attract more customers. Among robots that are in place is Optimus Prime, Bumblebee and Megatron. The largest robot a size of 60 meters high and weighs five tons. Each robot can be moved forward and backward and the priced at 100,000 Yuan ($16,095 USD) each. Hung, who is also a student of marketing, said that the workers there will download robot images from the Internet and use imagination to create their own robot. They did not make any sketches to produce the robot, otherwise, they totally dependent on their imagination so that no robot looks the same.